Do you have ancestry in the Darling Downs area? The Darling Downs is a region in Queensland, where the principal town is Toowoomba. 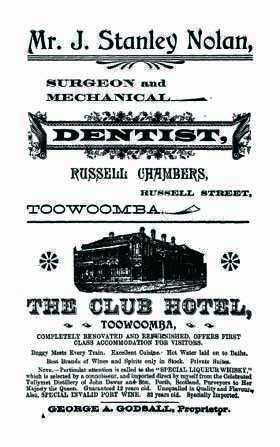 This 1900 edition of the Darling Downs Almanac and Directory contains a wealth of information relating to this region. Starting with the almanac, this contains a gardening section which is useful not only for the regular gardener, but also the amateur giving practical advice. There are hints to farmers, as well as domestic hints and recipes, times for arrival and despatch of mail, government departments, stations and their post towns, various miscellaneous information, such as; directions for making a will, treatment of snake bites, typhoid fever plus its treatment and more. The directory covers the towns of Allora, Clifton, Crow's Nest, Dalby, Drayton, Goondiwindi, Jondaryan, Leyburn, Millmerran, Pittsworth, Roma, Stanthorpe, Toowoomba, Turallin and Warwick. Each of these starts with gazetteer information on each location, then lists the names and occupations of the primary business holders in the district, as well as local government office holders, ministers of religion, office holders of institutions and societies. There are hundreds of advertisements from local businesses of the time, and thousands of names of persons mentioned throughout. A wonderful record of the Darling Downs as it was at the turn of the 20th century. This is a terrific genealogy resource for anyone exploring their family history in the Darling Downs region or building a family tree.